Started at the pin. Rounded weather mark in second just behind Chris Larr, with George Cousins and Peter Barton in hot pursuit. The three of us quickly passed Larr in big waves going right-to-left looking downwind. The lead shifted several times between Barton and me before I caught a few good wave sets near the leeward gate to round 3 boatlengths ahead. The chop on top of the big swells was vicious, making forward progress upwind quite difficult. The breeze was oscillating through about 15 degrees, with a few oscillating cycles per beat. I missed one of the cycles but got more correct, especially the last at the top to extend on the beat. Blasted down the reach, during which I hit a light-ish patch that allowed Barton and Cousins to get closer, then on the latter quarter of the run had a real case of the slows, allowing Barton to zoom up from astern. A bad gybe at the final mark and he was nearly overlapped, but I managed to get my act together and surfed a final wave to be clear ahead and prevail by less than 10 seconds. What a nail-biter! After a general recall, we had to wait quite a long time for another start under black flag. I had a good start near the boat, with Peter Barton about 1.5 boatlengths to leeward. He sailed low and fast over the boats to leeward of him, while I, noting we were in a header, sailed in high mode, not sacrificing much fore-and-aft speed. Nonetheless, 3/4 up the beat it looked like Barton would be first to the top mark, until he did another tack to get more left. I stayed on the (barely) lifted port tack, digging into a nice little header about a minute later then tacking on layline to reach the top mark in first. Extended nicely on the run and ended up with a 25 second lead over the hard charging Barton, with Cousins in 3rd. By now just about everyone was good and tired. I had trouble setting something up during my pre-start routine that left me a bit discombobulated. Managed to sneak into a little hole to leeward of Liam Willis at the boat during a black flag start, but slammed into one wave immediately after the gun that let both him and the boat to leeward pull ahead. Tacked quickly onto port, which was the favored tack anyway, ducked about 5 transoms then settled in. Sailed and sailed and sailed on port waiting for the compass to confirm it was OK to sail back to the middle of the course. When it finally did, I tacked over and had a big lead, rounding first after playing a final shift near the first mark. Extended from there. Cousins beat Barton in this one to stay in 2nd overall, with Barton four points back. Today was very long and I'm bushed, so this will be short. Left dock at 10am in very light NWly, took the better part of an hour to get to the course, where the breeze bounced between W and SW and occasionally freshened to 15-17 knots. 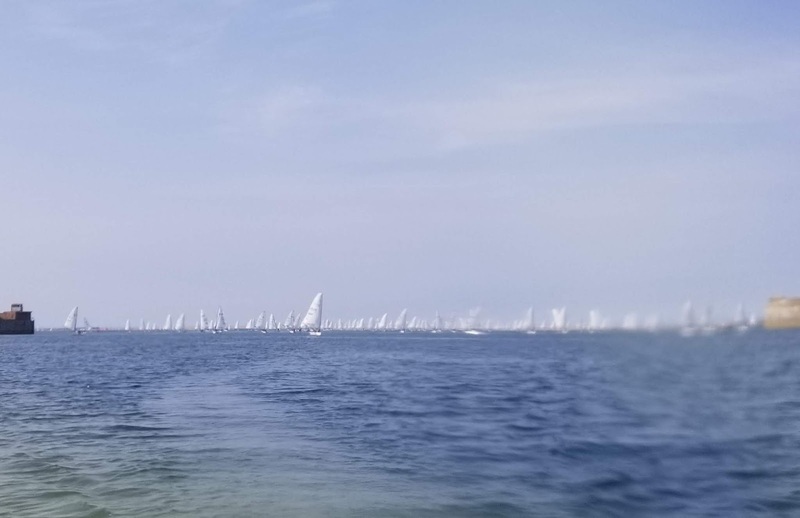 Since we were sailing trapezoid courses, the race committee waited for the breeze to settle down between races, which led to up to 1-hour gaps between races. That, and general recalls, kept us racing until 5:20pm, then a nearly 1-hour sail upwind/tight reaching home. Exhausting! Got lucky here. First, had a bad start at the boat, did 2 quick tacks to clear as a booming 40 degree righty had everyone planing to the weather mark. We gybed around the mark for another fast reach to the leeward gate. The committee abandoned the race near this mark, much to my relief, as I was in about 6th at the time. 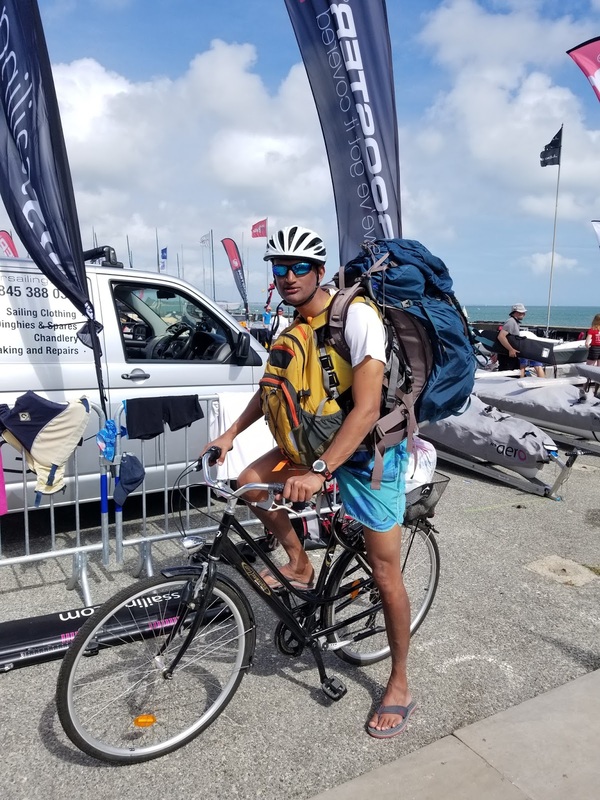 It was unfortunate for my training partner Madhavan, who'd had a great start and was walking away from everybody in the breezy reaching conditions. On the re-sail, had another terrible start at the boat and was shot out the back. Tacked over immediately and, with Chris Larr of the UK just to weather, couldn't tack until nearly on the starboard layline. Fortunately, we tacked onto a lift and crossed back to the middle of the course comfortably ahead of the fleet. Had another fast run and extended a bit before rounding the leeward gate. The breeze was really pumping now, and the chop was nasty. 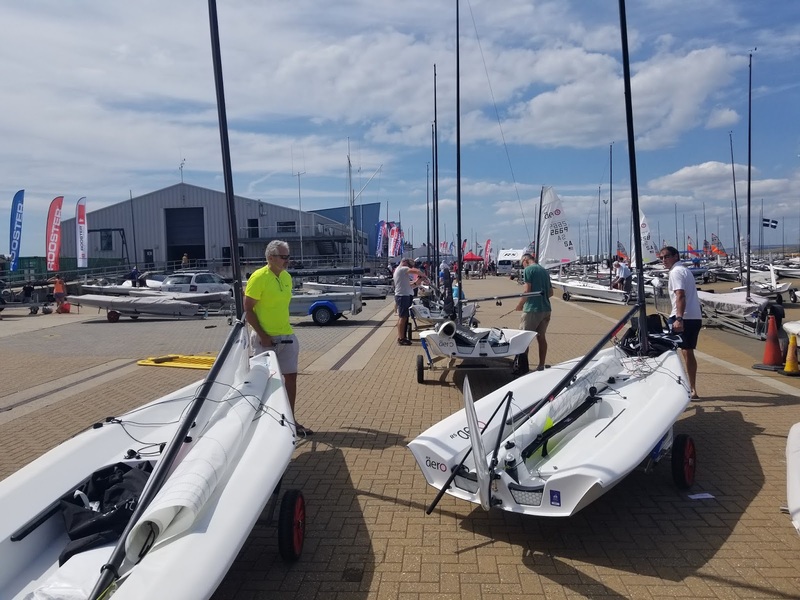 I tried "Secret Upwind Mode" (SUM, to be revealed in a few days) but it was too bumpy and I slid a bit to leeward of George Cousins, a very fit Brit. He also played a few shifts well near the top, but I called the last one right to lead at the second top mark. Held my own on the reach, extended a bit on the run, and had about a 20-second lead at the finish. More luck. Had a good start, but my downhaul wouldn't tighten. I pulled and pulled on the line, but...nothing. 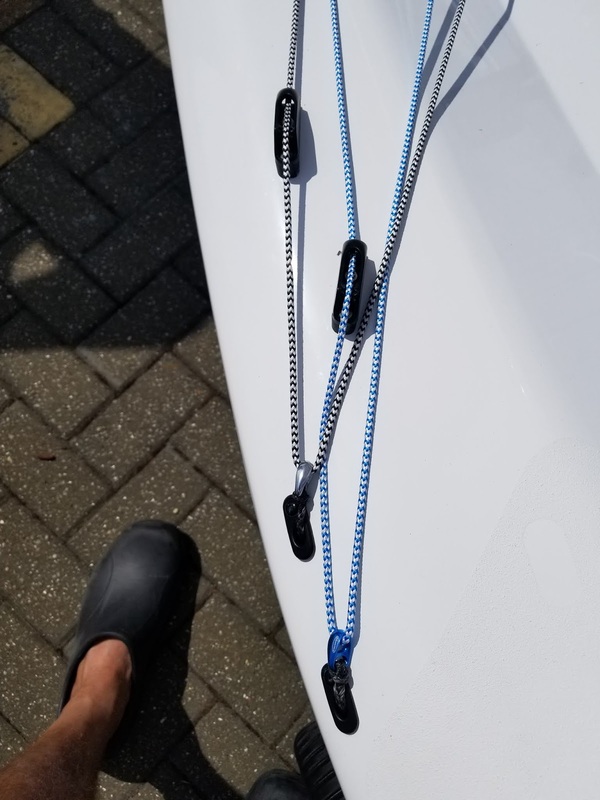 It took about 30 seconds to realize the line wasn't secured in the leeward cleat and, because the system is a continuous loop, I could have kept pulling for hours and nothing would've happened. Eased sail, reached down to leeward, cleated the line then sheeted back in. Fortunately, we were in a big right-hand shift and I had been able to keep going upwind at about 80% efficiency while fiddling with lines, so hadn't lost much. Peter Barton was to windward and ahead, Liam Willis to leeward and ahead. Once the boat was sorted I was able to move forward between the two Brits, with Peter tacking off my hip near the port tack layline. I waited until the breeze shifted a smidge more left and freshened before tacking and had a nice clear line to the windward mark. Extended handily on the first run in the puffy Westerly and rounded comfortably ahead. Misjudged a few small shifts allowing the others to get closer, then put the boat into SUM and just pulled away. Did OK on the first reach even though I hit a light spot the boats behind didn't, then extended on the outer run to lead by about 25 seconds after the short final reach to the finish. 5 first-place finishes is tough to beat. :) George Cousins has worked up into 2nd with 3,2,2 finishes today to be 6 points behind, while Liam Willis and Peter Barton are tied for 3rd another 5 points back. Upwind I'm fast, mostly due to good transitioning between stronger and lighter breeze. Also, because the Aero is so light, it accelerates like crazy when slightly cracked off. In the big shifts of today, I converted some lifts to cracked-off bursts of speed, and was also able to keep speed up while pointing high in headers. SUM helps in both these scenarios, especially in flatter water. Adjusting the downhaul in the puffs and lulls does also. Running I'm fast. It helps to be first to the weather mark (smile), but also have been keeping track of which shift I'm rounding in, then playing others down to the mark. Often there have been enough current differences on opposite sides of the course to reward working one side over the other. Finally, sailing dead-down in puffs and saving by-the-lee and reaching for lulls and catching waves translates into big gains over the course of a leg. Bad pic of 205 Aeros sailing to the racing area. Awesome sight! My training partner Madhavan Thirumalai and I were the first boats off the ramp this morning. 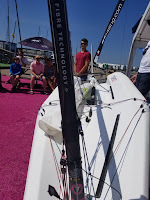 We were anxious to get acquainted with the racing area and do some upwind splits. "Splits" are when boats go off on opposite tacks for a few minutes (in our case, 3), then both boats tack back to the middle of the course. When the boats meet back in the middle, if one is ahead, that boat's side was the favored one. Madhavan and I did three, 3-minute splits, with the right coming out ahead 2 out of 3 times. We also noted that the wind shifted about 7 degrees left over the time we did the splits. It was so nice having compass angles for both tacks figured out and written down on the deck, easy to see. I also did a few current checks by tossing my full water bottle next to a mark and seeing what direction, and how far, the bottle moved in 30 seconds. Current determined, sailing angles determined, a basic strategy for the first leg determined (go right), we were armed with meaty info with which to start our Worlds. The 9s started last, which gave me about 25 minutes to watch the three other fleets going up their first windward leg. Contradicting the earlier split research, it seemed boats on the *left* side of the course seemed to be coming out ahead. 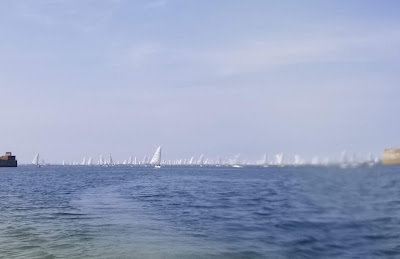 Generally accepted local knowledge is that left pays in a southwesterly, so, given the left hand favor to the start line and the fleets above showing left favor, I abandoned my earlier plan to go right about 2 minutes before the start and went to the pin. 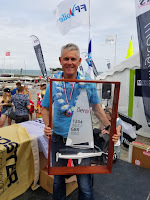 I was a bit too conservative off the start, with Aero legend Peter Barton to windward and two boats to leeward and ahead, all of whom left me in their dust after less than 30 seconds--yikes! I looked over my shoulder for a lane to bail out into, but if I went that way I'd have to duck behind nearly 2/3 of the fleet--unacceptable. Instead, I reached off to leeward of the leeward-most boat and concentrated on speed. 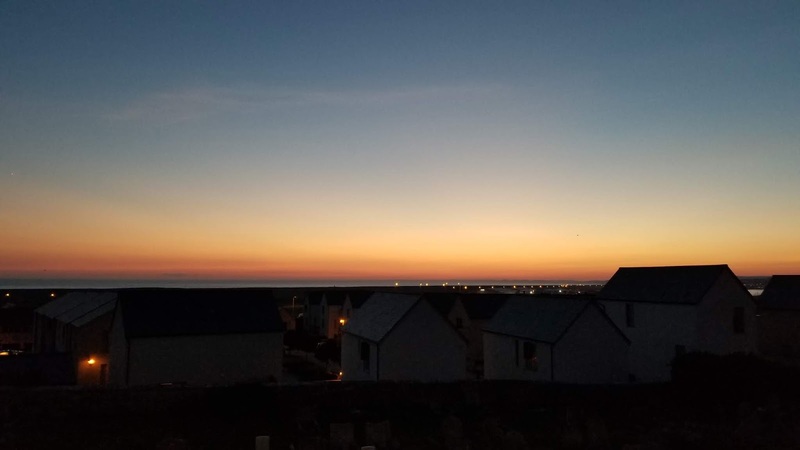 I lost a tremendous amount of height reaching down, but was able to work forward enough to have clear air, on the liifted starboard tack, for a long sail to the left of the course. The wind was quite steady, with little tiny shots of starboard lift. Several boats that liked the right or had bad starts peeled off onto port, so there was quite a bit of separation between boats going right and left. Separation = leverage, leverage = risk, so, about half-way up the leg, several of the boats near me toward the left tacked back to stay in touch with the fleet going right. I knew from the splits that the shifts were quite minor and slow to form. When boats to weather of me started consolidating right we were still in a right hand lift, so they were eating a bad port tack angle (and getting out of phase with the wind) to get right. The guy to windward of me was the last to peel back right, but I sailed for another 30-45 seconds into a nice little increase in pressure, tacking onto a new port-tack lift and hiking hard. Within a minute I was bow-forward of the guy who tacked a few moments earlier, and the two of us were launched, nearly laying the weather mark in good pressure, lifted, and in more favorable current! I rounded the weather mark about 30 seconds ahead of the next boat and extended, winning the inner-trapezoid race by about 45 seconds. After the race I had a badly-need slug of water, rested a bit, then re-checked the current near the start line. There was still current flowing roughly with the wind, a bit stronger at about 3/4 boatlength every 30 seconds. No-doubt noticing the left side was favored, the Race Committee re-set the line to be right-side favored for the second start. Because I had such a good idea what the tide was doing, I was able to set up perfectly at the committee boat (right) end of the line, blasting off in a right shift with great speed at the gun. As before, the wind was quite steady; I eventually tacked just below the port-tack layline on a slight left shift and was first by a handy margin at Mark 1. Had good speed downwind, then worked the left side on the second upwind, before blasting off on the final three reach-run-reach legs to the finish for another bullet. SO, good start to the event. "Lightning" Liam Willis, second to me last year at the Worlds in France, finished 2, 3 today, definitely scoring keepers. The wind forecast now shows increasing wind throughout the week, so it will be interesting to see how things go in planing conditions. After returning to shore and having a quick bite to eat, a group of us got together for stretching and massages. It felt good to get the kinks out! 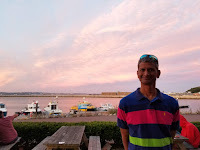 Madhavan and I decided to skip the scheduled Monday dinner in nearby Weymouth, instead grabbing Indian food on Portland Island and then walking home. Racing starts at 1130 tomorrow, so I have to be at the club earlier than today. Time for bed! 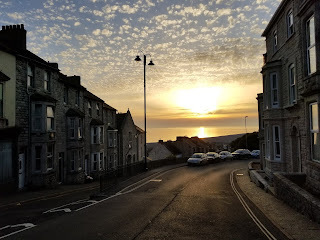 Chesil Beach and a beautiful sunset in the background. Just a quick note before bed. Warm, light air today. 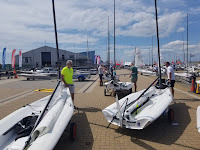 Did a bit of boat work, helped out running an on-shore clinic with 2-Time UK Aero 7 Champ Sam Whaley, then popped out for a quick two-hour sail in rapidly decreasing wind. Not much learned, except how vitally important hydration will be tomorrow in what is supposed to be even lighter air. After getting back, the official opening ceremonies for the RS Games began, with a parade of nations, then speeches by RS bigwigs and locals involved in the planning and execution of this massive event, which will take place over 3 weeks with over 850 boats and literally thousands of competitors and bystanders. It's quite impressive to see! Conditions for the regatta are meant to be quite light on Monday, then freshening throughout the week. Wouldn't be surprised if we only get a race or two in on Monday, then they'll try to make it up later. It'll be important to avoid major mistakes early, and get plenty of rest early as well for the grind to come. these lines run like buttah! 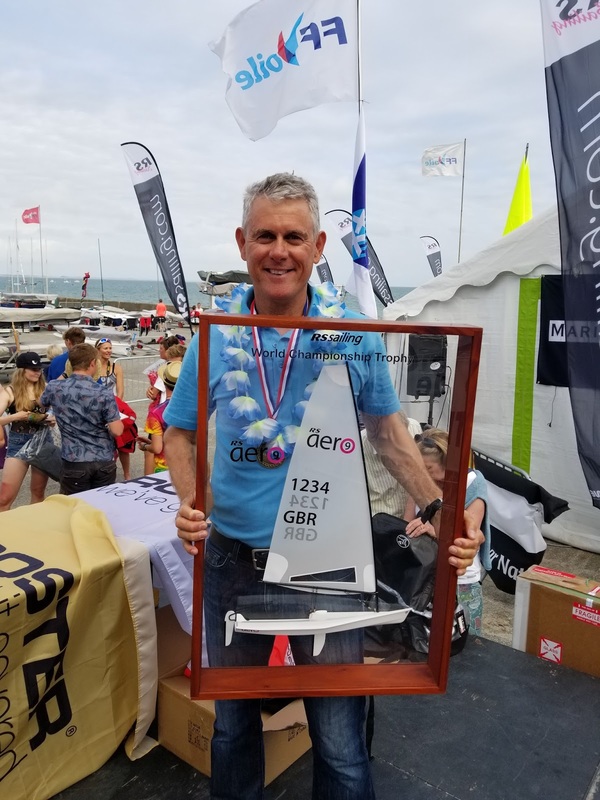 I've been in the UK for nearly two weeks, so it was nice to arrive yesterday at the Weymouth/Portland Sailing Center and rig-up my brand new charter boat for the 2018 RS Aero World Championship. Over 200 boats are entered in three divisions (5, 7, 9) for the event, scheduled to take place Aug 6-10, 2018. I am entered in the 9 class, as are approximately 50 other sailors from around the globe. Today, with the patient, skillful help of Sammy Isaacs-Johnson, I completely re-rigged and fine-tuned my downhaul, outhaul and vang (sail control) systems--they now run like glass. 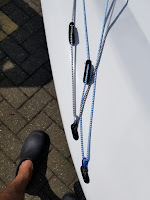 Normally I don't like to make any big changes to routines or boat set-up before big events; but, while visiting with Lymington sailor Karl Thorne earlier in the week, I tried his boat and became convinced modifications needed to be made. All up-side, as far as I'm concerned! that needed to be measured in. After getting the boat rigged then measured-in (inspected to make sure everything on it met the letter of Aero class rules), I popped out for what was to be a short sail with training partner Madhavan Thirumalai. Portland Harbour was completed in 1872 after 7 years' labor, and is, even today, the third largest man-made harbor in the world at 11,000 acres! That said, our regatta will be held OUTSIDE, which meant a very long sail across said 11,000 acre harbor and out one of its two entrances to the open ocean in a pleasant 8-12 knot Southwesterly breeze. Once outside, there were a few sets of bigger swells underlying a slight chop, making for interesting decision-making, especially downwind: work the chop, or try to catch one of those big rollers? Mess it up and the boat next to you gains 2 boatlenghts; get it right, and you gain 5! 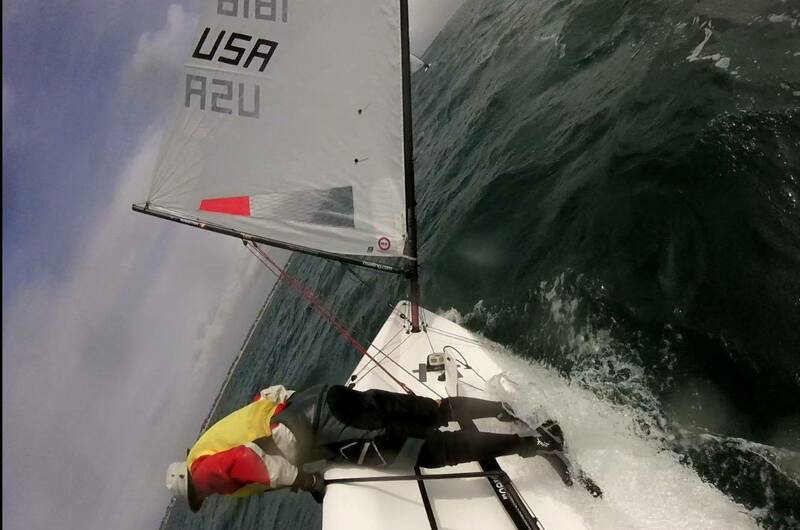 I seemed to have unusually good upwind height, so Madhavan and I switched boats to see if that would make a difference. During the changeover, both of us capsized (breaking my brand-new masthead wind indicator in the process!). The water was brisk, encouraging quick recoveries before we sailed upwind, did some reaching, then sailed the long beat up the Harbour back to the sailing center (site of the 2012 Olympic Sailing Games). 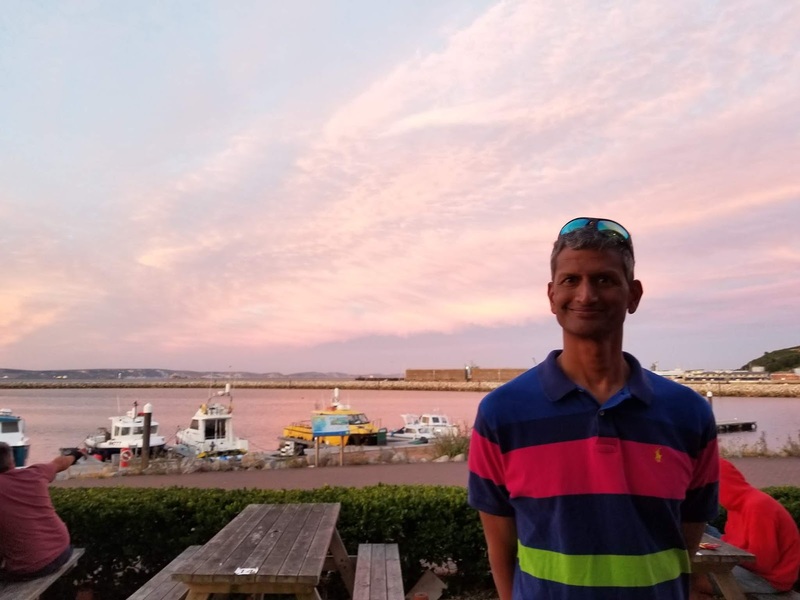 Back home in Connecticut, Madhavan had been much faster in certain conditions, so it was encouraging that, even after switching boats, my pointing and speed remained solid. 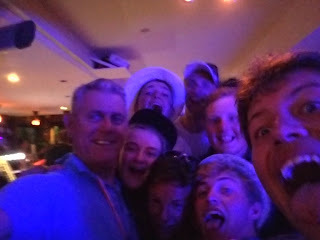 Tonight we joined several sailors at a local restaurant for dinner. Enjoyed getting to know new friends and catching up with those met last year, then the sunset walk back to my hotel, a shower, and now writing this quick note before bed. Eating better/more selectively, getting enough rest and conserving energy will help with 6 more days of sailing (5 of those racing) ahead!